C-DAC has developed an Electronic Records Management and Archival System named DIGITĀLAYA for the preservation of word processing documents, postscript documents, spread sheets, e-mails, images, scanned documents, presentations, text and xml documents in wide variety of file formats. DIGITĀLAYA provides a searchable database of record retention schedules and archival strategies as per the file format and preservation duration. It demonstrates the model implementation of e-GOV-PID Preservation Metadata Standard already notified by DeitY. In this system, the electronic records management includes processes such as identification, archival, migration, disposal and transfer of eligible e-records to trusted digital repository. 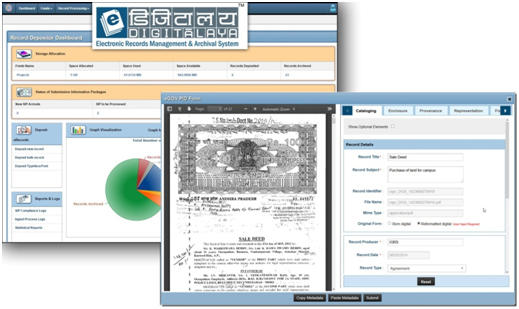 DIGITĀLAYA allows the record depositors to manage the access rights for e-records and encrypt the private records for confidentiality. Integrity and authenticity of e-records can be ascertained by using the digital evidences maintained by the archival system. It allows the authorized users to search, retrieve, view and download the electronic records as per the access rights. This system complies with the requirements specified in ISO standards related to records management, archival and digital repository audit. C-DAC has developed an e-Records Extraction Tool named DATĀNTAR for automatic extraction of preservation metadata in compliance with eGOV-PID Standard and for extracting the electronic records stored in the database of an e-governance system. 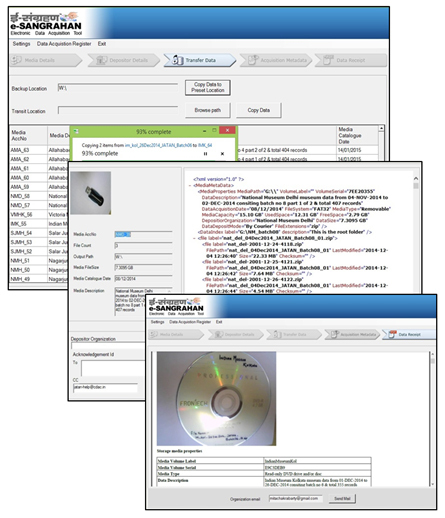 It allows the user to connect with e-gov database, upload and map e-record schemas with database, map preservation metadata as per eGOV-PID standard, schedule extraction of e-records, schedule transfer of e-records for digital preservation using the Open Archival Information System (OAIS), capture migration history and maintenance of batch logs. DATĀNTAR has been deployed for extracting the registered documents stored in the database of Computer Aided Administration of Registration Departments (CARD), Hyderabad. Huge amount of digitization has been already done by several organizations which does not follow the best practices essential for long term preservation. Therefore, the pre-archival processing tool called e-RUPĀNTAR has been developed in order to help in getting the digitized records in acceptable form as per the preservation best practices. 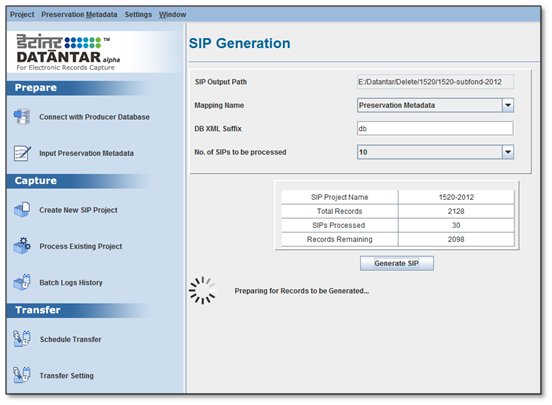 This software provides a collection of digital preservation best practices such as policy based and batch assignment of Unique Record Identifiers, batch cropping, image enhancement, image watermarking, OCR, structural tagging, conversion to PDF/A and creation of Submission Information Packages (SIPs) as per the OAIS standard. It also provides user management and registry of URIs. In case of manual acquisition of physical documents, the archives have to maintain a physical register / inventory of the document received from any organization. On the contrary, when digital data is received the archives are not in a position to manually register the list of millions of files stored on the digital media. Therefore, in order to address this requirement, e-SANGRAHAN (ई-संग्रहण): e-Acquisition Tool has been developed, which receives digital data in offline storage media like DVD, flash drives, tapes and automatically extracts the list of contents received in the package and sends an acknowledgement report in PDF format through e-mail to data depositor. Data deposits are as important and valuable as financial deposits for the data depositors. Therefore, it extremely important capture all evidentiary details of the entire e-acquisition process. 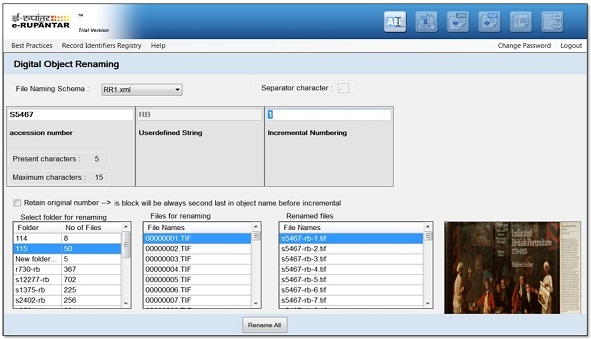 The software automatically extracted technical properties of storage media such as serial number, make details, volume name, storage capacity, actual data size, file count, etc. Therefore, the software is also supported with web camera interface for capturing the external details of storage media. e-SANGRAHAN Tool maintains an e-acquisition register with search and retrieval for ensuring consistency between the received data and archived data. The data depositors normally copy the data on DVD, Flash Drive or any other storage media and send it for archival purpose by courier or by hand or through network. Due to unavailability of any secure means, the data is openly sent wherein it is vulnerable to data theft and unauthorized access. Therefore, DATA HASTĀNTAR (डेटा-हस्तांतर): Data Encryption and Transfer Tool has been developed which helps the data depositors in encrypting the data package before transferring it for archival. The digital repository managers, archivists, librarians need to convert the existing metadata into another metadata format for various purposes. It is very difficult to get readymade tools that can help in mapping the metadata schemas and convert large volume of XMLs. There are plethora of metadata schemes being designed and used in various fields. Therefore, META- PARIVARTAN software tool / API library has been developed to enable large scale conversion from one Metadata format into another metadata format such as MARC21 to Dublin Core or e-Gov PID to Dublin Core, METS to MODs, etc. This tools is completely metadata neutral and flexible for usage. This tool /API library can be used to integrate with any other Project or can work by itself and supports all versions of metadata formats. Using this library one can visually map one Metadata tags to another in automated manner(UI). Most of the e-governance projects as well as archiving institutions have to produce documents in PDF format. However, the scanners and PDF libraries used by e-Gov application developers tend to produce proprietary PDF documents which are not recommended for preservation purpose. Either they have no awareness of PDF/A-1b format which is an ISO 19005 open archival format meant for long term preservation or even if they are aware they are not able to produce / convert into PDF/A-1b document. Therefore, PDF/A-1b Converter Tool has been developed.